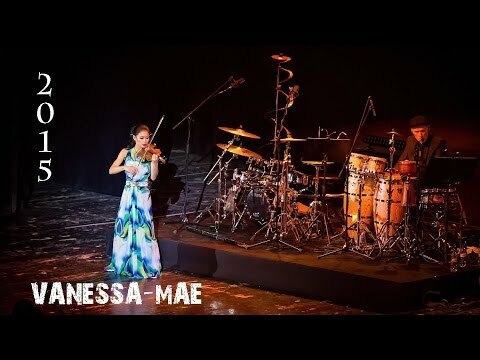 Watch Vanessa-Mae perform at Crocus City Hall in Moscow from December 2015. A BIG Thanks to avid Vanessa-Mae fan CrazyCat! This December concert’s length is about one hour and thirty minutes, and it is my favorite out of all the concerts thus (make sure you check CrazyCat’s channel for the previous years’ concerts). Here, you will see Vanessa-Mae perform a wide assortment of music. Some of which dates back to her very first pop album: The Violin Player. This concert also has the distinction of being the only where Vanessa-Mae did not use her Guadaganini violin. She explains that there was an accident, and the violin’s scroll was broken. However, she is happy to report that due to some quick thinking by the organizers, they were able to procure her another violin. She starts out with a very old favorite of mine – Red Hot. Then she continues with Havanna Slide and Morrocan Roll. On top of the fantastic track listing, she also had a full orchestra and conductor, which is rare. Normally, Vanessa utilizes just her band and a string section. She also divided the concert into two parts, ending the first half with ‘Storm’ from her pop album by the same name. Upon reappearing for the second half, she says she’s starting to get more comfortable with the violin. She reiterates that this is the first time she’s played on another violin since she was 10 years old! She then plays one of the most beautiful pieces from her album Choreography ‘Roxane’s Veil’. I particular loved the piano accompaniment that’s absent from the album version. The visual and audio quality is quite good for an amateur video, and I’m sure you’ll love it as I do. Enjoy!! Next Next post: Vanessa-Mae calls her Guadagnini violin “Gizmo”. Why is that?